Brunswick Plantation offers 27-holes of outstanding golf with each of its 3 nines presenting a different challenge. Brunswick Plantation is located on Hwy. 17 just a few minutes north of North Myrtle Beach across the North Carolina border in Calabash. The Magnolia Course is reminiscent of the links of Scotland with its extensive mounding, sand bunkers as well as grass bunkers. Avoiding hazards is key on this course as three of its holes have water and three different holes feature heavy bunkering. The Dogwood Course winds through dense hardwood trees and coastal terrain while bordering the Caw Caw Creek. The course is fairly wide open and features hole #6 with an island green. 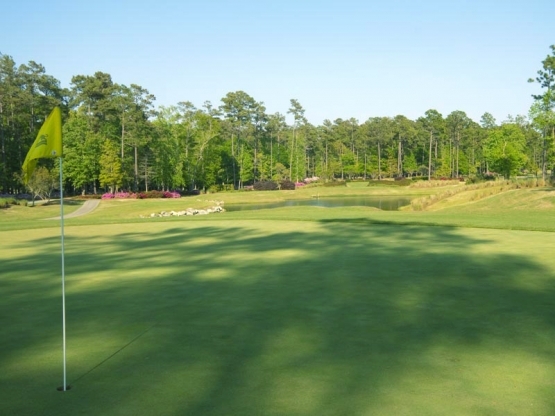 The Azalea Course winds through dense forests and has plenty of water to test even the best players. Another island green is featured on this nine. All three nines at Brunswick plantation off a challenge for every level of player. Myrtle Beach golf lessons are available at Brunswick Plantation as well as great Myrtle Beach golf. If you are bringing your children on your Myrtle Beach trip, juniors 16 and under are charged the prevailing cart rate. After finishing your round on this Myrtle Beach golf course you may want to stop in Calabash, N.C. and experience some of their world famous Calabash seafood. Book your Myrtle Beach golf pacakge and add Brunswick Plantation today! Pretty good, good large greens with slope, lots of water, needs good yardage book for hole definition, 3 nines.